Written on December 18, 2014 . Posted in Announcements + Updates, Architecture and Design. Work by Cas Holman (Assistant Professor, Industrial Design) has been featured in Fast Company’s Best Kids’ Design list of 2014. Rigamajig is a 263-piece building kit for classrooms. 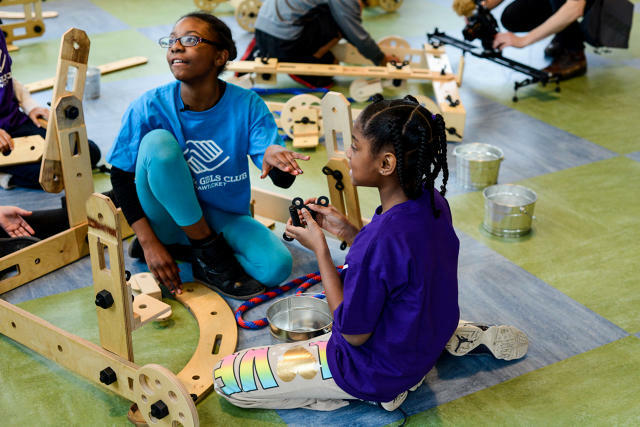 As kids improvise with building elaborate contraptions, or “Rigamajigs,” from planks, wheels, pulleys, nuts, bolts, and rope, they learn about engineering, architecture, creativity, and collaboration experientially. And they can make everything from three-legged rocket ships to elephant movie projectors. There are no instructions and no batteries.